The Mediterranean is a region of great culinary diversity, and the food there is renowned for being both exceptionally healthy and unfailingly delicious in equal measure. While many Mediterranean foods are now familiar the world over, there are still many hidden treasures that await discovery, and one that has recently been growing in popularity is fregola sarda, a unique type of Sardinian pasta. 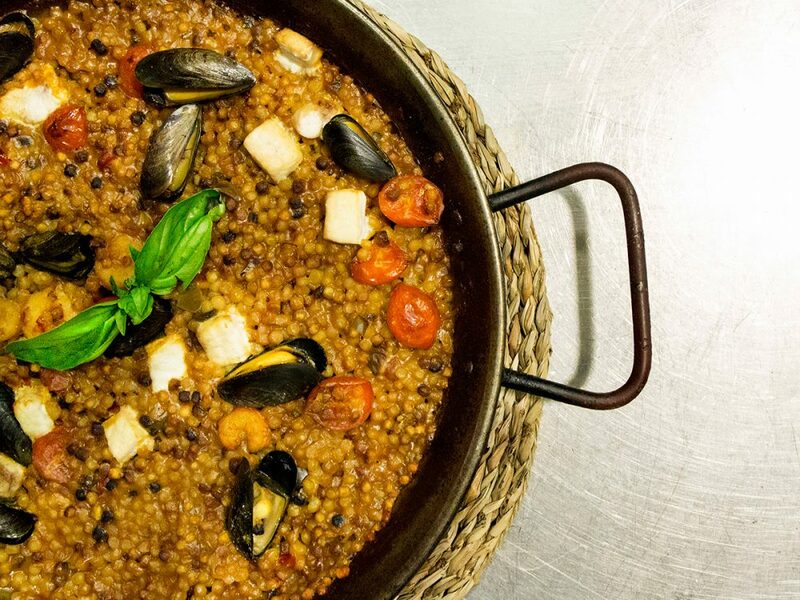 To put fregola sarda in its context, let’s begin by talking a little about the food of Sardinia in general. While Sardinian cooking is undeniably a part of Italian cuisine, like the island itself, it is also separate and distinct from the food of the mainland. Due to its strategic position right in the middle of the western Mediterranean Sea, Sardinia has endured a sometimes turbulent history that has seen wave after wave of traders, invaders and settlers making their way to the island. Successive arrivals all brought their own culture and traditions, which the Sardinians absorbed and incorporated into their own while still retaining their own individual character. This effect is perhaps most apparent in the food of the island, which shows influences from the nearby mainland, especially the cuisines of Pisa and Genoa, but also from more distant lands such as Spain’s Catalonia or even North Africa and the Middle East. This mixing of cultures on the island has seen the evolution of certain foods and dishes that are uniquely Sardinian and are found nowhere else. Sardinian cuisine relies heavily on the produce available on the island and in the surrounding seas and is neatly divided into the food of the coast and the food of the interior. Inland specialties include roasted baby goat and wild boar cooked in an underground hole, while typical coastal fare may include octopus salads, spaghetti with sea urchins or fregula cun còciula, fregola with clams – see below for the recipe. Another local delicacy that needs to be mentioned is casu marzu, literally meaning “rotten cheese”. Not for the fainthearted, this is a cheese that starts life as a pecorino but is allowed to ferment and then decompose, aided by the digestive juices of the maggots from a particular species of fly. The cheese is eaten with the live maggots still inside, and those partaking need to pay attention as these maggots are capable of launching themselves into your face in a desperate attempt to avoid being eaten. In many ways, fregola sarda (known as fregula in the local Sardinian dialect – sarda is Italian for “Sardinian”) encapsulates much of what is typical about Sardinian cuisine in a single food. Somewhere between regular pasta and couscous, it is a food that shows the influence of peoples from beyond the island’s shores. In fact, fregola sarda is sometimes known as “Sardinian couscous”, although the grains are larger in size than regular couscous. It is made by sprinkling water onto durum wheat flour and then rolling it in a circular motion until the flour forms into irregular little balls. 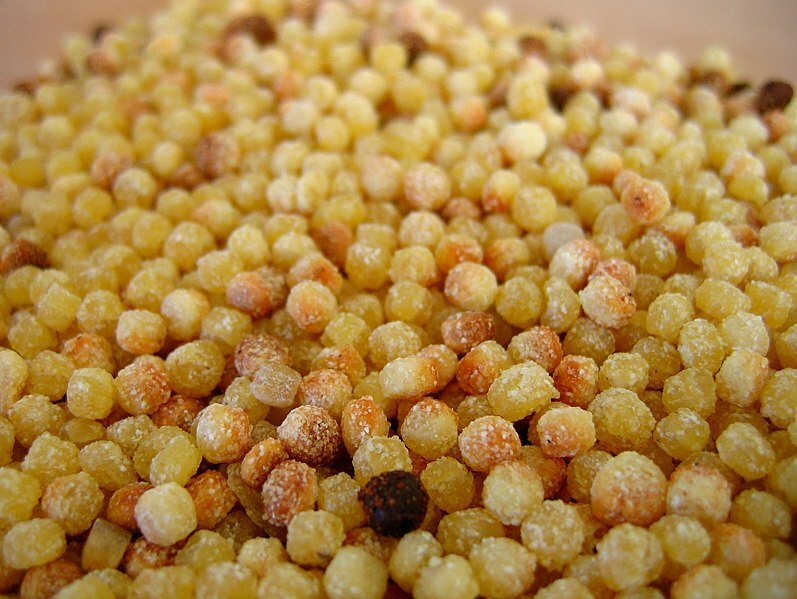 This process gives its name to the food – the word “fregola” comes from the Latin word fricare, meaning “to rub”. These balls may be colored with saffron and are then toasted in a wood-fired oven, imparting a characteristic nutty flavor. After toasting, they take on a marbled appearance in various shades of yellows, golds and browns. They have a course exterior that is ideal for soaking up sauces and are dense and chewy when cooked. It is a rustic and extremely versatile food that was traditionally used to prepare a range of hearty fish soups and mutton stews. Nowadays, it is also incorporated into irresistible cold salads or eaten with shellfish, among others. Of course, having read all about this wonderful Sardinian pasta-couscous hybrid, you will doubtlessly be eager to try some. If you can lay your hands on authentic fregola sarda, here are a few recipes to tempt your taste buds. Incidentally, if you can’t find the real thing near you, it can be ordered online. If not, you can substitute with Israeli couscous or orzo pasta – but bear in mind, the result won’t be quite like the real thing. In Sardinia – as in the rest of Italy – a meal traditionally consists of a primo piatto (“first dish”), usually pasta, a soup or something similar. This is followed by a secondo piatto (“second dish”), generally meat or fish accompanied by contorni (“side dishes”) of vegetables, potatoes etc. If you are preparing a traditional Sardinian or Italian meal, fregola sarda should be eaten as a primo piatto – but of course, feel free to serve it and enjoy it any way you see fit! 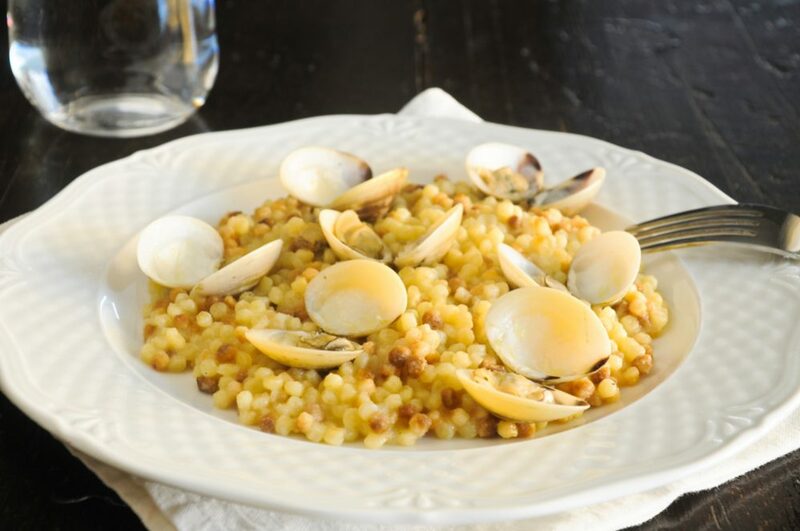 Fregola sarda with clams is a dish most closely associated with Sardinia’s capital Cagliari, located in the far south of the island. Here’s how to prepare them. Heat the olive oil to a medium heat in a large saucepan and add the garlic. Fry briefly for around 30 seconds. Add the tomatoes, pepperoncino and pepper and cook for around four minutes until the tomatoes soften and start to break down. Add the white wine and parsley, reduce the heat and simmer for five minutes. Arrange the clams on top of the sauce and cover for five minutes to cook. Remove the open clams and set aside. Repeat in batches until they are all cooked. Discard any clams that don’t open. Once the clams are cooked, add the stock and bring to the boil. Add the fregola, cover and cook on a low heat for 15 minutes. Fregola is properly cooked when it is al dente– taste from time to time to judge when it is ready. Season with salt, pepper and pepperoncino as required, put the clams back in the pot, stir in and cover for another minute or two to reheat them. When the clams are ready, serve immediately with a light sprinkling of parsley to garnish. Another popular way to eat fregola sarda in Sardinia is with tomatoes. Here’s a simple but irresistible recipe if you want to try at home. Preheat the oven to 375°. Toss the tomatoes, garlic, sugar, oregano, one tablespoon of olive oil, a pinch of salt and some pepper together in a bowl. Turn out into a roasting dish and place in the oven for around 25 minutes or until the tomatoes are just starting to brown. While the tomatoes are in the oven, bring a pan of water to the boil, add a teaspoon of salt to the water and then pour in the fregola to cook. It should take around 15 minutes and should be al dente and chewy when done. Taste periodically to ensure you don’t overcook it. Drain in a colander when ready. To make the pesto, remove the roasting dish from the oven and retrieve the three garlic cloves. Remove the skins and discard, put the garlic cloves into a blender with the pine nuts, basil, pepper, salt, the rest of the olive oil and the pecorino or parmesan. Blend to make the pesto sauce. Combine the fregola sarda, tomatoes, olives, goat’s cheese and pesto in a serving bowl and garnish with a couple of fresh basil leaves to serve. Fregola sarda is extremely versatile and can be eaten with a range of dishes, either traditional or more experimental. Here are a couple of other ideas to help fire your creativity in the kitchen. Fregola sarda tossed with shredded endives, toasted hazelnuts, capers and basil – an intriguing salad that can be served warm or cold. 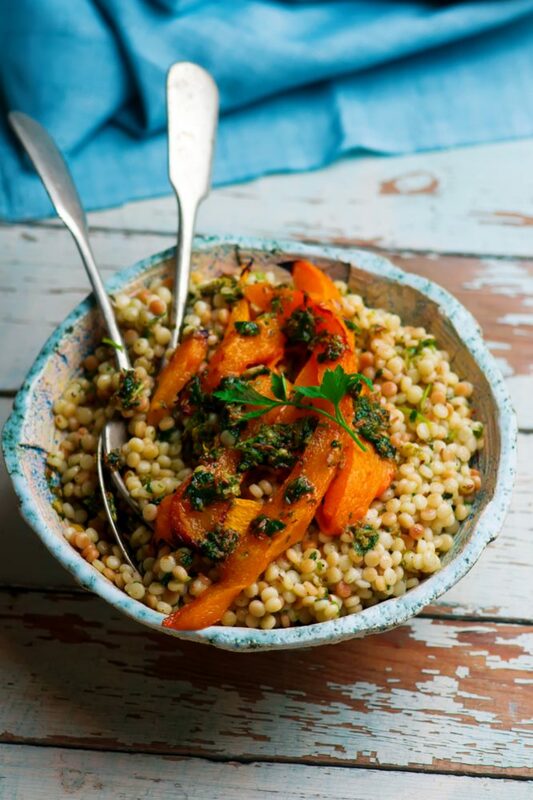 Fregola sarda with chopped fresh basil, mint and chives mixed with the zest and juice of one lemon and a generous dash of olive oil – similar to a couscous salad. Fregola sarda is a typical Sardinian staple – at once simple, rustic and hearty – and always delicious. It is also an extremely versatile type of food that can be incorporated into a wide range of dishes. If you have the chance to visit the island of Sardinia, you shouldn’t leave before sampling it at least once. However, even if you can’t travel to its land of origin, you should still be able to come up with some tasty and original fregola sarda dishes to try at home.